We’ve been talking about these two words for the last two days. These words are yours to use as you please. My hope is that over the last two days, and with what we discuss today, you will have enough information and a renewed sense of permission to begin using these words with freedom, and without guilt or shame. Before we look at the three times you can/should say “Yes” and enjoy it, let me make a caveat: “Yes” does not guarantee giggles and sunshine. The pain of becoming debt free always comes before the joy of debt-free living! The pain of losing weight and building muscle always comes before the joy of a strong, healthy body. The pain of fear and rejection always comes before a successful business. You get the point. But in case you don’t check this blog post out. OK, here are three times that you can/should say “Yes” and enjoy it! #1 You should say and enjoy your “Yes” when you have planned for it. One of my favorite verses in the Bible is Proverbs 21:5, “The plans of the diligent lead to prosperity….” This is true not only financially but relationally, spiritually, physically, etc. If you want to have margin (i.e. extra) then you must create and diligently work a plan. I have found that unplanned generosity often causes unnecessary pain. For instance, I’ve seen people make a “spur of the moment” decision to give an offering based on emotion. I’ve also seen those checks come back… bounced. The problem was not the heart… it was a lack of margin! Their emotions wrote a check their reality could not cash! If you don’t have it… you can’t give it! BUT if you have it then you can give it… and enjoy every second of it! This principle is true for money, time, energy, relationships, etc. If you plan for it you will have it. If you have it you can give it, if you wish, and enjoy it! #2You should say and enjoy your “Yes” if you have adequate margin. This principle builds on the first one = if you have planned for it, say “Yes” and enjoy it! This principle simply means that you have it now. The plan has worked! If you don’t have it, say “No” and don’t be ashamed. If you have it, say “Yes” and enjoy it! You planned for it, you’ve created margin and now you can say “Yes” without it being destructive to your life! #3 You should say and enjoy your “Yes” if there is joy somewhere in the process. Remember the caveat, “‘Yes’ does not guarantee giggles and sunshine”? Well, there’s some small print to that caveat and it is this, your “Yes” may not bring IMMEDIATE joy, but it should lead to eventual joy. The shame of the death walk… not fun. The pain of death… no giggles there. BUT the joy of seeing people forgiven and changed… that made the “Yes” worth it! 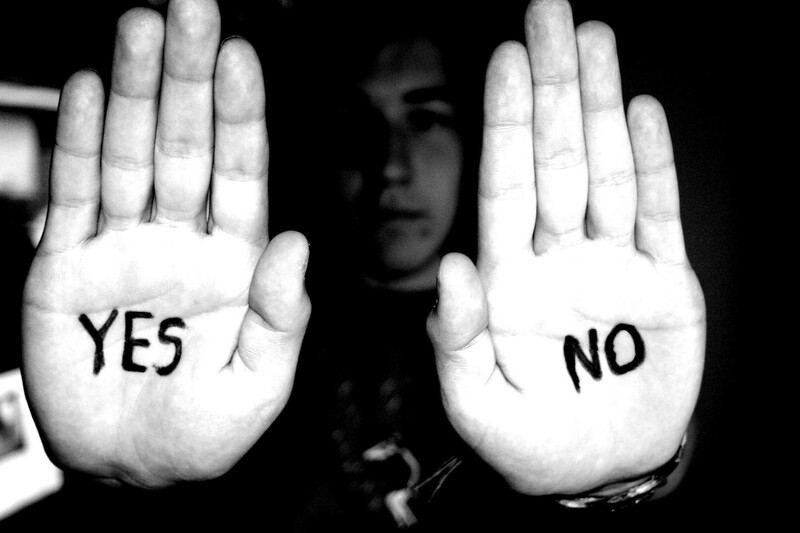 If your “Yes” is the result of manipulation, arm-twisting, “compulsion”, etc. you will quickly find… there’s no joy in this “Yes.” For the person though who has a plan, has created margin, and is willing, if necessary, to endure a bit of pain to experience the joy of “Yes”… there are good things to come! This brings to mind Dave Ramsey’s famous line, “Live now like no one else, so that someday you can live like no one else.” In other words, say “yes” to the pain of sacrifice today so that you can say “yes” to the promise of abundance tomorrow! OK, that’s it! Two words that can set you free… now go and use them!